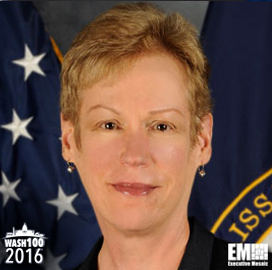 Executive Mosaic is pleased to introduce Betty Sapp, director of the National Reconnaissance Office, for the second consecutive year as an inductee into the Wash100 — Executive Mosaic’s annual selection of influential leaders in the government contracting arena. Sapp, appointed director in July 2012, guides and supervises all matters for the Chantilly, Va.-based intelligence agency and carries out other responsibilities assigned by the defense secretary and the national intelligence director. At the GEOINT 2015 symposium in Washington, she said NRO has taken steps to make military satellite constellations more resilient through a next-generation program. She started her government service with the U.S. Air Force as a uniformed officer and held positions in the areas of acquisition and financial management. Sapp joined the CIA in 1997 before she became deputy director for business plans and operations at NRO in 2005. She was named deputy defense undersecretary or portfolio, programs and resources within the Office of the Undersecretary of Defense for Intelligence in May 2007 and transitioned to the NRO principal deputy director post two years later. Executive Mosaic congratulates Sapp for the receipt of this award.